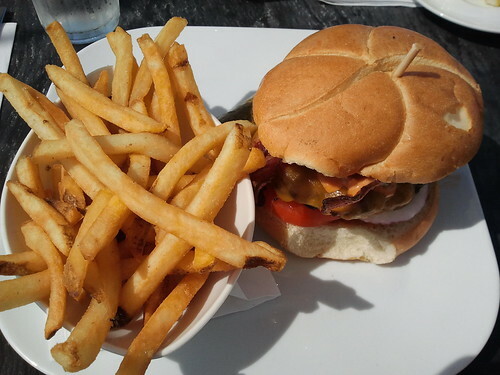 Decided to try out Moxie's Burger today. The description on the menu is "all our beef burgers are served on a toasted kaiser & topped with lettuce, tomatoes, red onions, pickles & grainy dijon burger sauce" I asked for avocado and I got it ! The burger was pretty good - not too greasy, not too dry. Overall, this is fairly average - nothing to go crazy about, but also good enough for a second time. Price below includes cheese and bacon added for $0.99 each. 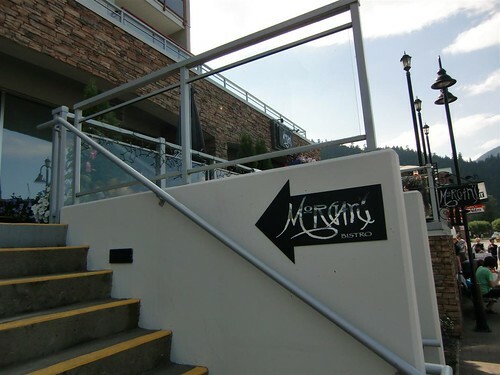 Well, I decided to spend the day in Harrison Hot Springs and when I was hungry, I walked by this nice little restaurant. Of course, I had to try their burger ! 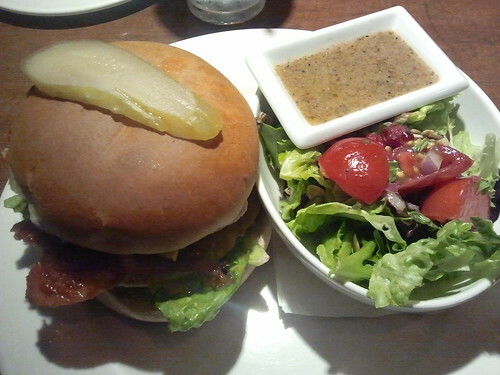 I had their Angus Burger, which has tomato, lettuce, pickles, cheddar, bacon, caramelized onions and a chipotle mayo. I asked for fresh avocado and the server said, sure if we have it. I can tell you now, that they didn't have it or they forgot. Anyways, the burger was very good, nice and juicy. I thought it tasted great; however, I wasn't impressed with the amount of butter slathered on the bread - I actually didn't finish the bread, because it was so greasy ! If I was to make further recommendations, I would say use romaine lettuce and one extra strip of bacon. Otherwise, this was an outstanding burger. If I had it again (which I would), I would just asked for an un-buttered bun. Someone suggested to me that I try out one of ABC's new burgers. They seem to be promoting their burgers quite a bit in the media. So, today, I looked over their selection of burgers and decided on the Swiss, Bacon & Avocado Burger, but I asked for cheddar instead of swiss. 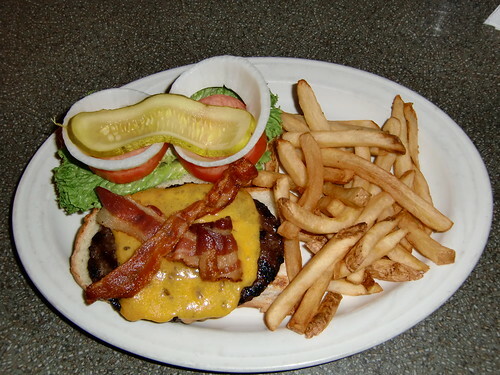 This burger is described as "A grilled soft pretzel bun, burger sauce, beef patty, Canadian natural Swiss cheese, two slices of grilled smoked bacon, and fresh avocado" It also has tomato, romaine lettuce and a mayo/relish sauce. The burger patty is flame grilled, so it has that great flavour, that you can't get from the flat top. 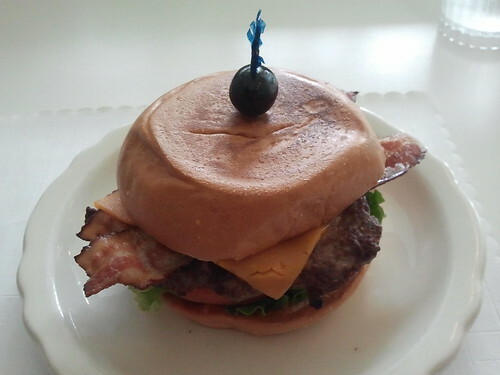 The burger was presented very nicely and tasted pretty good. Even though the patty was flame-grilled, it was kinda of small. I would have liked to have seen a larger patty. 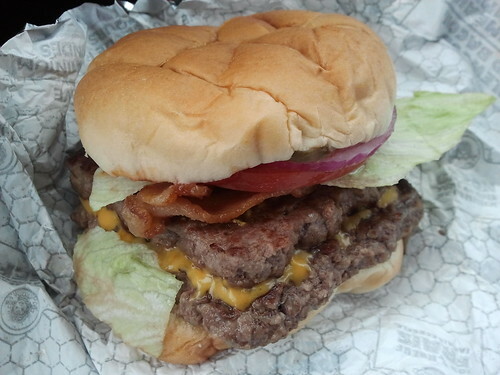 Overall, this is a pretty good burger, especially considering it is from a family restaurant. 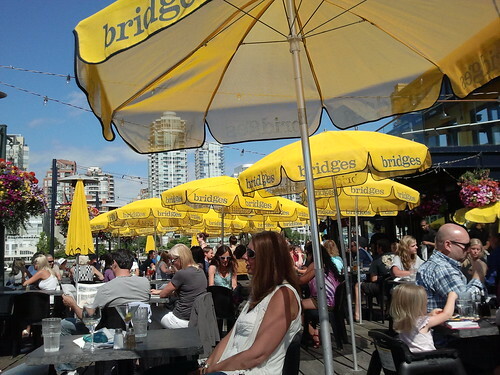 After a nice kayaking adventure in False Creek, we decided to go to Bridges Restaurant. I had the "Bridges Classic Burger", which is described simply as "cheddar cheese, bacon, fries" I asked for fresh avocado, but unfortunately, they only had guacamole. At this price ($17.00) I was expecting something over the top. When the burger came, it looked fine - It was presented in a closed fashion and had tomato, iceberg lettuce, white onions and a mystery sauce that looked like it was splatted on the top half of the bun - it looked like 1000 Island, but had a spicy kick to it - actually, it wasn't too bad. Overall the burger was quite tasty, but the patty was nothing special. At this price, you must go with a prime rib patty or something special. Also, I'm tired of ordering fairly expensive burgers served with iceberg lettuce - I feel that premium burgers should have better lettuce, such as romaine. I think, at this location, you're paying extra just for the scenery. 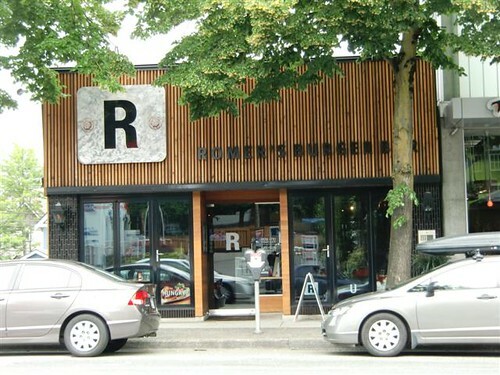 There's a nice little burger joint in Kitsilano and its called Romers. 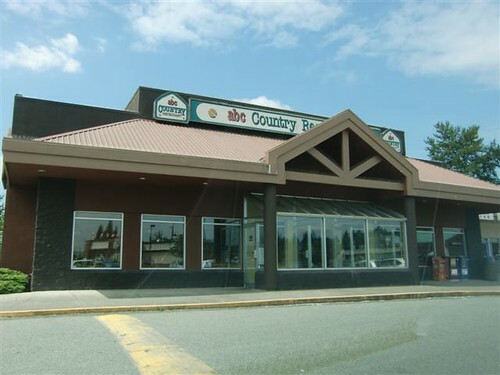 Romers is a cozy restaurant with nice ambience and its located on busy 4th Avenue, one block west of Burrard Street. Today, I had the Standard burger which is described as "All-natural beef, vine-ripened tomatoes, iceberg lettuce, onion, pickles, R sauce" The R sauce is similar to 1000 Island dressing. 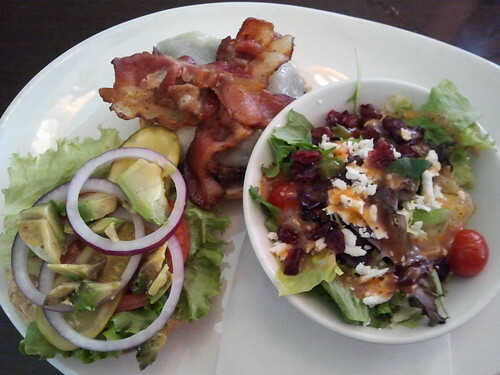 I asked for this burger with bacon and cheese and avocado - Unfortunately, they forgot the avocado ! The R sauce didn't do too much for me; I would prefer a more bolder taste. The bacon was curly and dry - I want my bacon flat and glistening !! The bun was pretty good - it held together fine and tasted okay. The patty was decent - not a whole lot of flavour. Overall, the burger was just okay in my opinion - nothing to write home about. 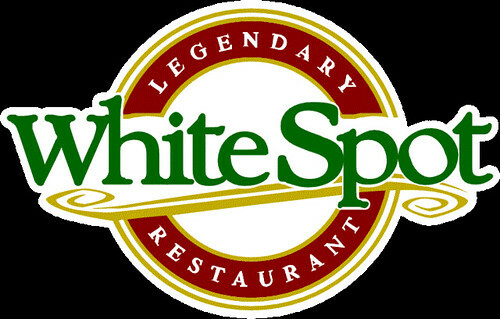 One thing I would like to say is that the servers were very nice and the decor in the restaurant is nice. They have some pretty nifty burger concoctions on their website, so if any of those strike your fancy, check it out - It just may be YOUR favourite burger ! Mr. Mikes was the place to go tonight. They were promoting their burger at a local event (I didnt try it there), so I decided to try it in the restaurant. I had the Bacon Mikeburger. 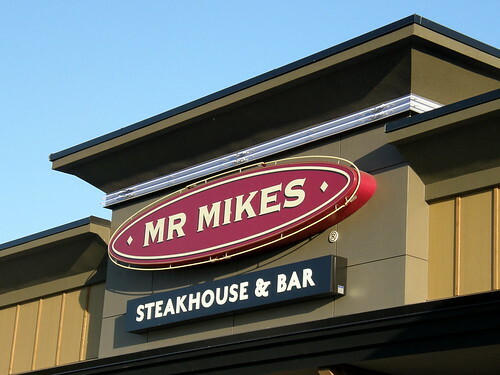 Mikeburgers are described as: "grilled over an open flame, served on our famous toasted garlic French loaf with Mikes special sauce and fries. All dressed or straight up - it’s the burger that won the west" The burger tasted pretty good; however, look at the size of those onions !! - I took them off - I think they would have ruined the flavour of the burger. I didn't find that the special sauce did much for the burger - just not the right flavour for me. And the french loaf that's its served on is unique, but a little too much bread for me. Overall the taste was alright, but I'm not crazy about this burger. 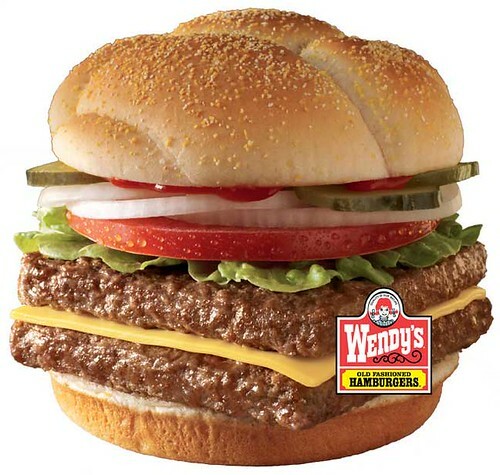 Today, I decided to have one of Wendy's old fashioned burgers - the Double Cheese to be exact. I added bacon for an extra $0.90. It comes with two 1/4 pound patties, processed cheese, iceberg lettuce, onions, tomato and pickles. For a fast food burger it was just fine - it satisfied my temporary grease and salt cravings (I haven't had a burger in 3 weeks !!). 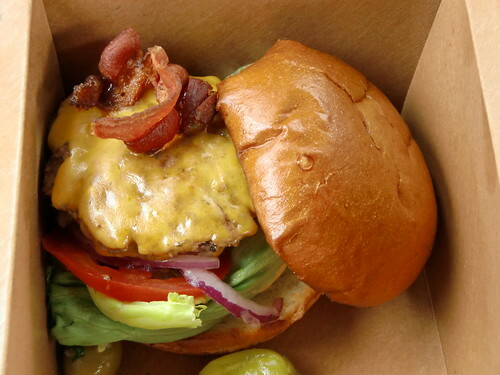 But this burger does not compare with most restaurant burgers, and specialty burger joints. I've been to White Spot many times, and now I have finally had a burger from their "bigger burger" selection. I had the Bacon Cheddar Bigger Burger, which is described as a 6 oz., 100% pure beef patty with hickory smoked bacon, aged cheddar cheese, lettuce & tomato with the famous Triple "O" sauce. I asked them to be easy on the sauce. 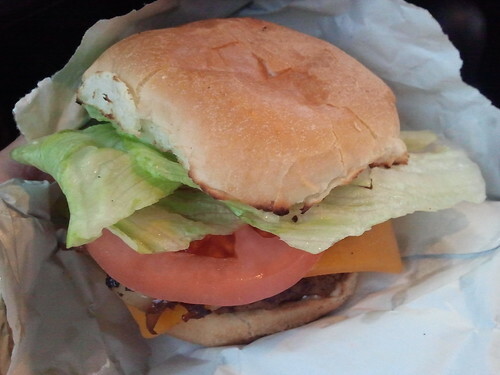 The burger came closed, looked really nice and had a plain jane bun, but that's fine with me. The burger wasn't overly greasy, but still had some great flavour. The bacon was done perfectly - not over cooked or burnt as sometimes happens. Overall, I was quite satisfied with this burger. 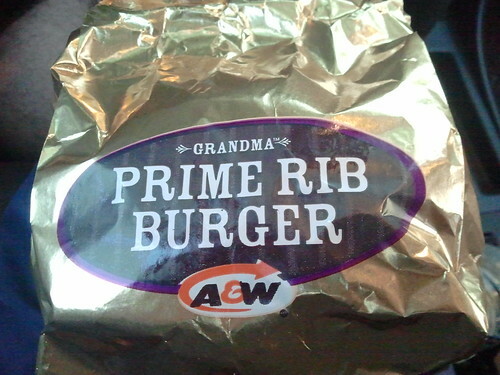 A&W has come out with the new Prime Rib Burger. 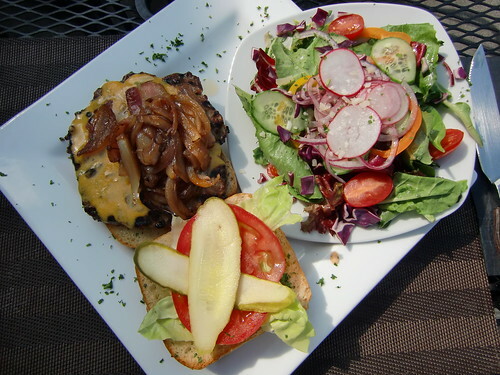 The standard prime rib burger comes with only caramelized onions. I added cheddar (extra $1), bacon (extra 70 cents), lettuce (extra 35 cents) and tomato (extra 35 cents) to mine. The burger was just okay, but nothing too special. I would prefer A&W's uncle burger any day over this one. I feel that the burger needs some seasoning or a special sauce. They asked me if I wanted horseradish on the side (I said no). Overall, I wouldn't waste my time on this burger. As I said, the uncle burger is much better; the teen burger is even better IMO. Time to try out another burger specialty joint. 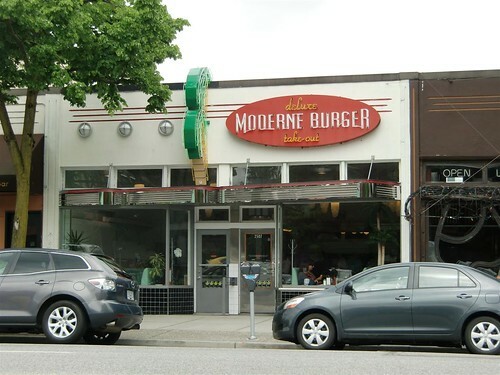 Moderne Burger describes their burgers as "hand made steak burgers, made fresh daily using no fillers, preservatives or seasoning of any kind" They also don't put butter on the bun, which IMO, is a great thing; they do have their own house sauce. I had the standard burger (which comes with tomato, lettuce and red onion) with cheddar and bacon. 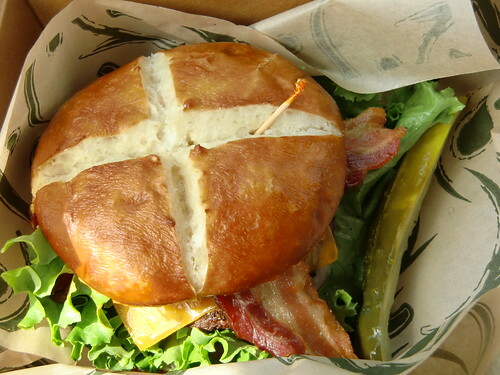 As you can see from the photo, the bun is interesting - I think it was sourdough. Either way, it worked. The burger smelled and tasted great - it held together fine and didn't get soggy. This is a definite recommendation and the price was very good too !